All the teachers came back two weeks ago and the students last Tuesday. Saying that work was busy was an understatement! As a technology director there are always lots of meetings, questions, and concerns as the new year starts, but at the same time it is fun to catch up, see what people have done during the summer while you got things ready at school, and share in the excitement of the new year. I am really thankful for a wonderful little phrase that runs around The FAIR School like an epidemic: “Let’s make a Doc.” Yes, they are talking about a Google Document. We have hundreds, thousands, and maybe even hundreds of thousands of these documents. As we enter the third year of our time with Google I have to say that I greatly appreciate many of the features of a Google Applications for Education domain user. One of them is the instantaneous collaboration created by a simple document. Just two weeks alone we had meeting notes, agendas, shared calendars, teachers updating their websites, and our overall workshop week calendar all hosted in our GAFE domain. Last week our leadership team was in a meeting planning the open house and we quickly made a document to share with the rest of the staff. We all pitched in, knew what was going on, and even our assistant principal (who had to step out for a few moments) knew exactly where we were and was on the same page. It worked out really well and the power of Google docs continues to amaze me on a daily basis. However, not every idea we try always works out really well. I remember the first time we sent out a Google Form to participants in our summer school program and we forgot to uncheck the box that says “have respondents login to their domain account to fill out the survey.” Yeah, that was a bit of a mess. Everything has a learning curve to it, but sometimes using the right tool truly does make a difference. It could be a Web 2.0 tool (my favorite right now is an awesome little site called Schoology) or even a great piece of software (SMART Notebook 11 is improved for the Mac), but in a classroom there is a time and a place for every tool. It’s kind of like a box of crayons. If you need to color someone’s hair you might choose a dark or light color depending on your purpose. There are lots of choices, but ultimately you use the one that makes the most sense for your situation. For sure, you do not select the blue crayon. Doesn’t the same kind of thinking apply in our classrooms? If we want to have students work on a podcast we probably have them use Audacity, GarageBand, or some other recording software. We do not have them use iMovie. That is the blue crayon and it is used for something totally different. We have to pick the right tool for the situation and outcome we desire to see. Yes, that is a SMART Board. No joke, and it has Expo markers at the base of it. Anyone using the wrong crayon here? Seriously, how many times have I told my teachers, “Don’t write on the board with anything but the markers that come with the board. No Expo markers, magic markers, pens, etc.” Does that video make any one else’s head just shake? Just imagine if that board was being used to its full potential. What a difference that could make in a classroom! Example Two: I was recently part of a discussion where we needed to sign up for groups based on individual preferences. This was a very interesting experience because the tool we used to sign up was a wiki. One thing that you should probably know about a wiki, if you don’t already, it only allows one person to edit a page at a time. That is correct, blue crayon use here. It was slightly frustrating and annoying to be “stealing the lock” from other people who were putting their names on the same wiki. There are so many better uses for a wiki than to have people sign-up for their groups and a lot of easier, more initiative tools to have people collaboratively form groups. The use kind of made me scratch my head and wonder. As you start off the school year, please consider which color crayon you are using. 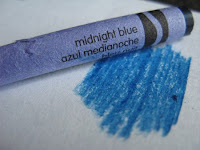 Do not force a blue crayon into a brown crayon area. Brown is for the hair, blue is for the sky. Furthermore, using pencil and paper works just fine for writing a paper instead of some new, advanced, Web 2.0 tool. We cannot, and should not, choose to use the tool only because we have this idea that it will be “cooler” or “will lead to more engagement.” That is not the main goal in education. We want our students to learn. The tool comes secondary. Keep in mind the educational goal first and then choose the tool. 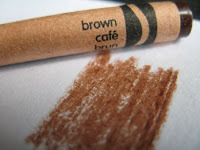 However, make sure you choose a brown crayon instead of a blue one!